The Iris top entry cat litter box has a sleek, attractive look and is available in several colors. Its lid is designed to pull off any litter sticking to your cat’s feet when it exits, reducing litter tracking on your floors. Its rounded shape means there aren’t any corners to jam a litter scoop into, making scooping easier and more efficient. The Iris Top Entry Cat Litter box isn’t afraid to, well, think outside the box! Below are Iris top entry litter boxes for sale on Amazon and eBay. The Iris top entry litter box. This one’s from Amazon. It’s shown in white, but Amazon almost always has a choice of colors. Below is the Iris Top Entry Cat Litter Box from Amazon and eBay. This page makes it easy to compare prices and selection between these two major online sellers. IRIS Top Entry Cat Litter Box, IRIS USA, Inc.
IRIS Top Entry Cat Litter Box with Scoop, Gray and White, IRIS USA, Inc.
Be sure to see the Amazon customer reviews for the Iris top entry litter box. Why Have An Iris Top Entry Litter Box? 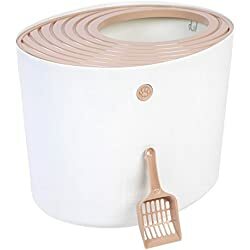 Keeping Litter Off The Floor: Cats that love to scratch, fling, or cover their litter box deposits with a crazy, maniacal vengeance are rarely a match for a top entry litter box: The Iris Top Entry is so tall, and most of the lid is covered, so the litter stays inside. Your cat can have a litter flinging party to satisfy their deepest urges, but still not be able to scatter it all over your floor. That Lovely Lid: The Iris Top Entry Litter Box is a available in two different styles of lids, both designed to keep litter off of your floor. One style has a lid with small holes in it. This way when your cat hops out of the box any litter clinging to their feet falls right back down into the litter box. The other style of lid has grooves to catch the litter is Kitty leaves. Either way, litter tracking onto your floor is greatly reduced. Tip: Cats are agile, and some may not want or need to step on the lid as they exit. For that reason some cat owners with top entry litter boxes say it’s helpful to put the opening on the top on the litter box against a wall. This way Kitty will have to step on the lid, knocking off the litter, before hopping down onto the floor. Shyness: Some cats can feel shy or vulnerable when using the litter box. So much so that they may resist the urge until they can have some privacy from people and/or other pets. A top entry litter box can provide them with the privacy they need so they’re not tempted to “hold it” or find another place in the house to relieve themselves. Using The Litter Box Is Not A Game: If you have other pets or children that like to play with and annoy your cat while they’re trying to do their thing in the litter box, a top entry can really cut down on bathroom time interference. This not only adds to the overall sanitation in the home, it’s another factor in keeping your cat happy to use the litter box instead of looking for alternative locations. No More Dog Snacking Or Toddler Tampering: If you have a dog in the house that thinks what your cat leaves behind is a fun snack, or a playful toddler that likes looking for buried treasure, a top entry litter box makes diving into the used litter a lot harder to do. Odor Control: Litter box odors tend to stay inside a top entry litter box instead of wafting out into the room. Pleasing To The Eye: The Iris Top Entry Litter Box doesn’t look like your conventional, rectangular cat litter box with exposed litter. Many people, in fact, might not even recognize it as a litter box until they get close to it. Even then it will look like an attractive, modern, piece of kitty furniture with the unsightly mess hidden from view. This allows you to place it almost anywhere in the home without fear it will make a room look unsightly. Helps to prevent litter scatter and contain spraying. Large top entryway for easy entry and exit. Lid design helps remove litter particles from the cat’s paws. Rounded shape makes cleaning easy.